One of the more extensive ways to Custom Restyle you car is to reshape the front fenders into full Fade-Away units. Creating a more elegant and exclusive looking car. Several years before the Fade-Away fenders would become part of the Custom Car scene, car designers were already experimenting with the long sweeping lines of front fenders moving back all the way to the rear fenders. This created a much different look and feel than the cars people were used to see back then. Cars with separate front and rear fenders, functional units to cover the tires and keep the body clean. These new long fender lines make a car look much longer and lower, more elegant. 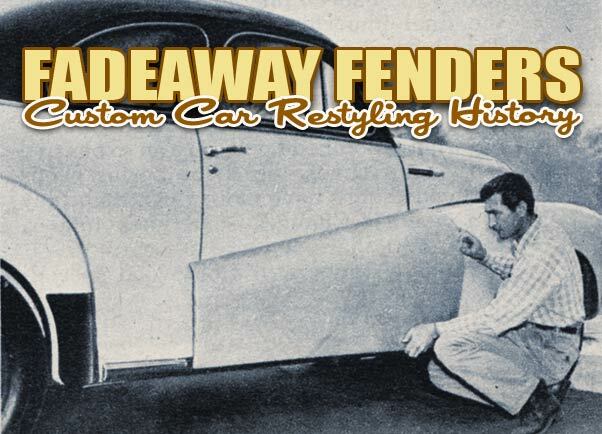 We do not really know who was the first to create these designs for the full fade away fender line, most likely this happened around 1934 for the first time, and became more used from 1936 and up. 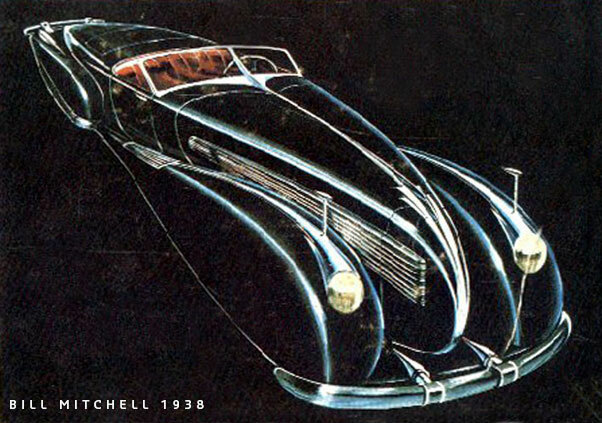 Alexis de Sakhnoffsky created this wild design in 1936 for a boat tailed v-windshield roadster with flowing Fade-Away fenders. 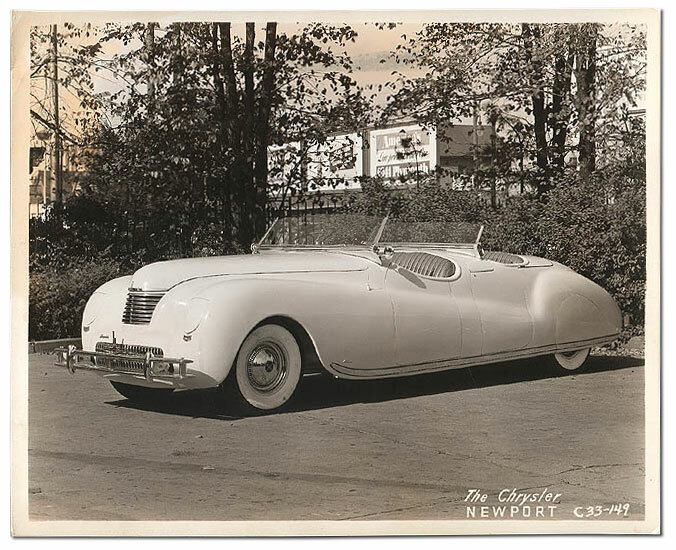 Bill Mitchell designed this stunning looking speedster with long, full fade-away fenders in 1938. 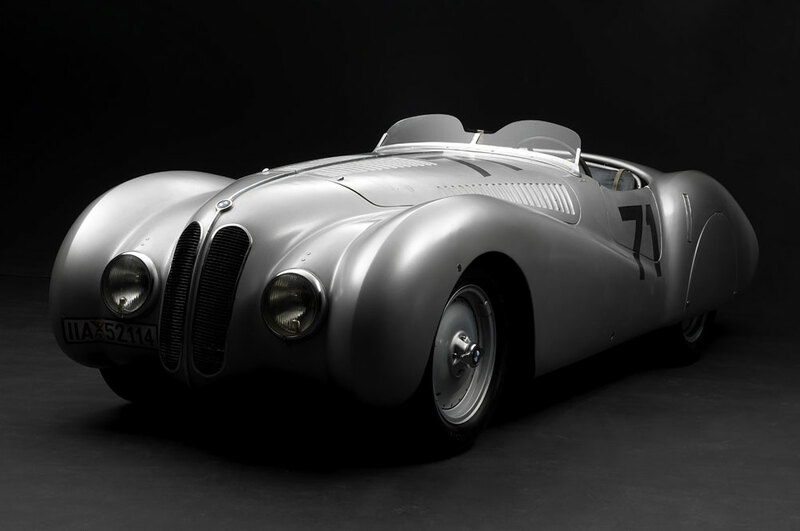 1937 BMW 328 Mille Miglia ‘Buegelfalte’ was re-bodied in 1939 and recieved a wonderful streamlined body which included full Fade-Away fenders and fender skirts. 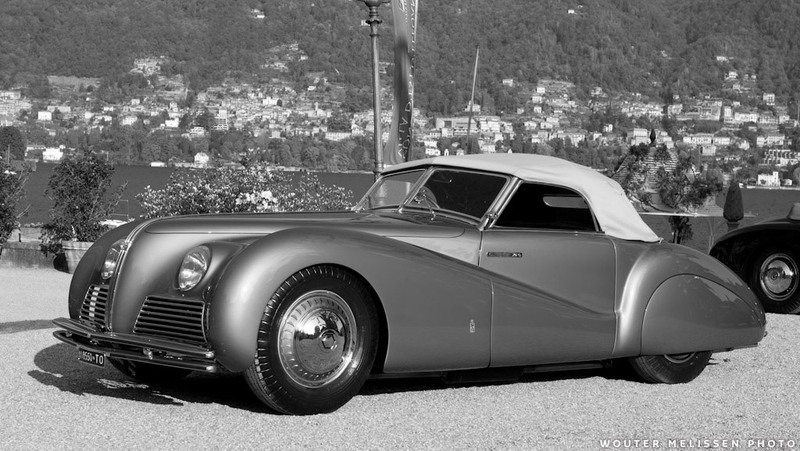 Pinninfarina created this stunning Alfa Romeo in 1940 with full fade-away fender and teardrop shaped bubble skirts. Another early produced car with the use of full Fade-Away fendered was the 1940 prototype created for the Chrysler Corporation by LeBaron. They named the dual cowl smooth full Fade-Away fendered car the Chrysler Newport. Coachbuilders from Europe where starting to designing and building cars with fade-away fenders as well. Around the same time the first Custom Car builders started to experiment with the fade away fenders also. Harry Westergard, Less Crane and Jimmy Summer were Custom Car pioneers who all get credit from being among the first to create the full Fade-Away fenders on a custom car. 1940 Chrysler Newport dual cowl phaeton, designed by Ralph Roberts from LeBaron and Alex Tremulis and created by LeBaron. It had breakthrough flowing lines with smooth, fluid fenders foreshadow the full envelope styles that would develop years later. Its beautiful, organic shape was subtly accented by the elimination of the visible body seams necessary for all other cars with their bolted-on fenders. 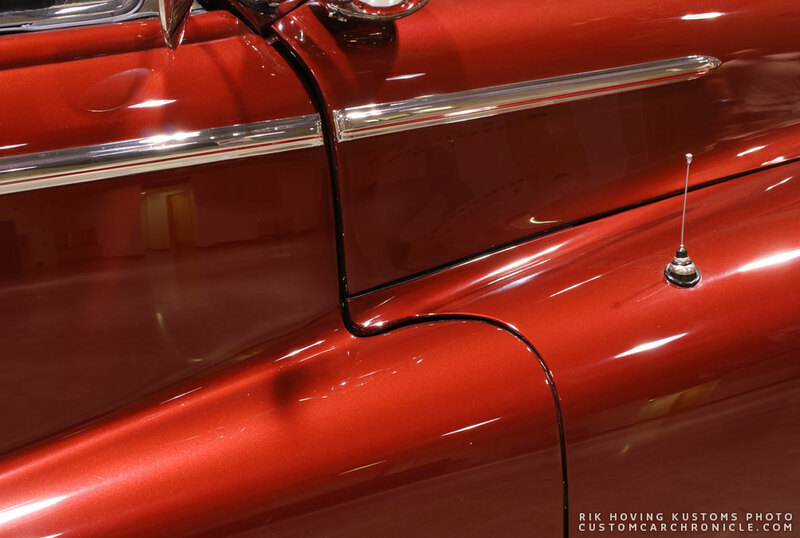 The Newport’s hood, deck, doors and fenders were completely smoothed, with no design-interrupting ornamentation. LeBaron’s devotion to a smooth, uninterrupted flow of the body panels extended to integrated rear fender skirts executed in the teardrop shape of the fenders, a flush cover for the top and even recessing the license plate into the deck-lid and covering it with glass. All touches that would later become the standard for many Custom Cars. 1940 Chrysler Newport dual cowl phaeton with full fade-away fenders. In the early days, when some of the cars were restyled used in this article there where no magazines or books devoted to Customizing. But in 1944 and later the first publications appeared, and in these the Fade-Away fenders restyling technique was mentioned. Dan Post named it “Tack On” fenders, and with his books he most likely has inspired several customizers to add fade away fenders to their car or their customers cars. The Dan Post Blue Book of Custom Restyling showed several Custom Cars with the fade-away fenders, and explained in the text how this was done. The image above shows a spread from the 1951 edition of the Dan Post book, and the technique is called Tack-On Fenders. 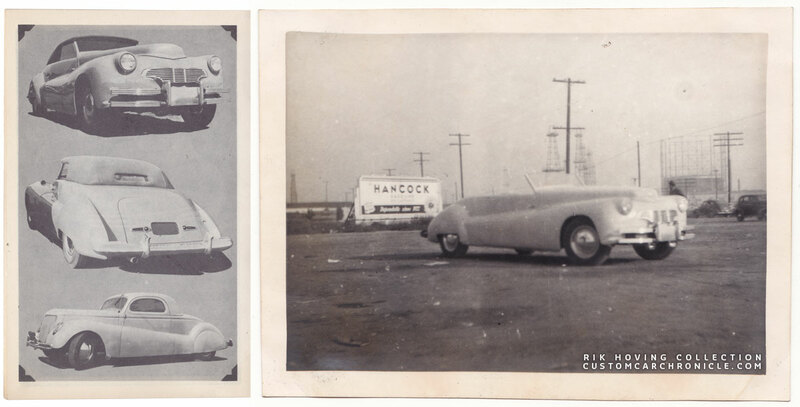 Another page in the Dan Post Blue Book of Custom Restyling showed two photos of an unidentified Convertible with an oddly styled grille and full Fade Away fenders. This car can be seen in all of the Dan Post books. The page also shows a nice side view of the Bob Fairman 36 Ford coupe with Jimmy Summers created fade away fenders. The photo on the right comes from my personal collection. I still have not been able to identify this car from the Dan Post books, no name, not even the brand car used. If anybody knows more, please let me know. The Hop Up magazine from January 1953 devoted an three page article on the Fade-Away fenders. Photos and diagrams where used to explain how they could be created. The in progress photos show the 1941 Ford of Frank Monteleon getting full Fade-Away fenders installed at the Barris shop. Edward the Eighth, King of Great Britain, abdicated his throne in 1936 to marry the American, Wallis Simpson. The couple was henceforth known as the Duke and Duchess of Windsor. In 1938, England appointed Edward governor of the Bahamas. Close to the United States, Nassau proved a quick trip to New York City, where the pair kept a suite at the elegant Waldorf Astoria Hotel on Park Avenue. 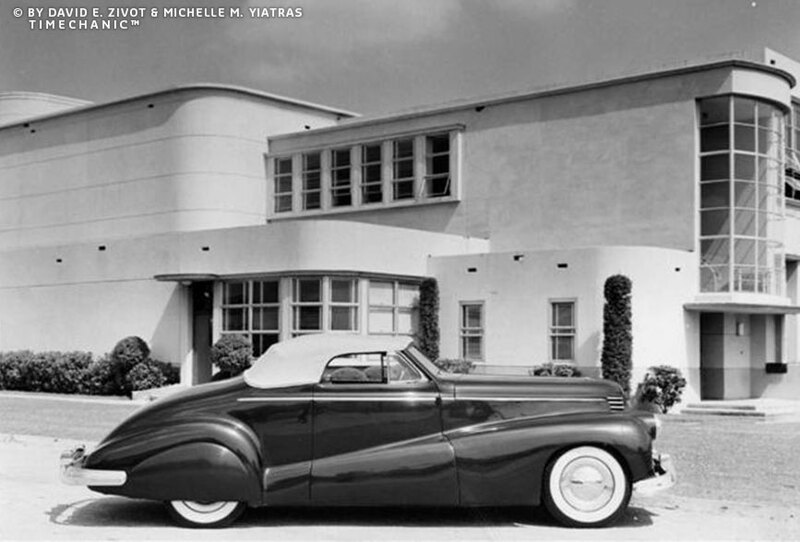 During their first stay in late 1941 at the Waldorf Astoria hotel, where the couple kept a suite, the Windsors received a car, based on a 1941 Cadillac, from one of their society friends, Alfred P. Sloan Jr., the chairman and CEO of General Motors. Delivered in the waning days of old coachbuilding and the Classic Era, “The Duchess,” as it became known, was one of the final, truly one-off, coachbuilt Cadillacs, as well as one of the most famous Cadillacs ever produced. Beautiful lines of the coachbuilt 1941 Cadillac for the Windsors. 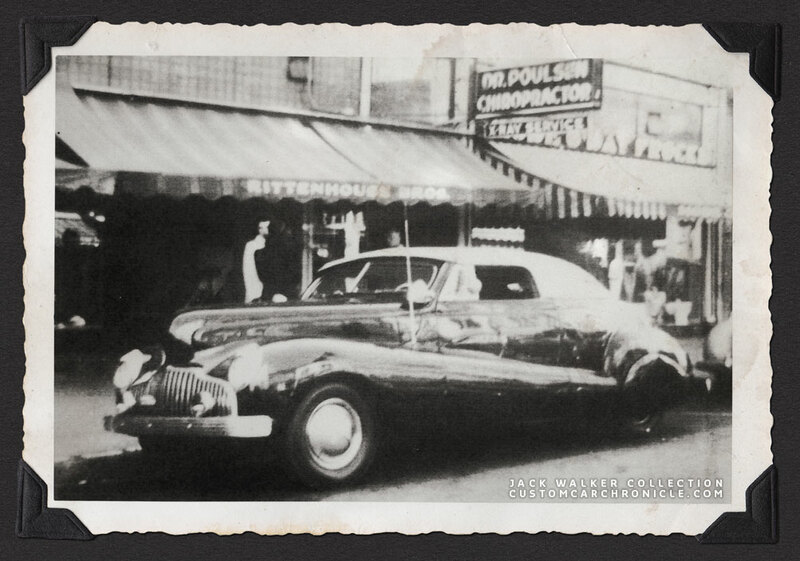 The car could be seen in several news paper and magazine articles in the early 1940’s. Perhaps influencing some custom builders? Not a single body panel on the Windsors’ car matched any other 1941 Cadillac. The hood, trunk, fenders, fender skirts, roof, and doors were all crafted by hand, and all interior appointments were hand-fitted. The fenders were, and remain, the car’s outstanding feature. Beginning with a crest over the wheels, they extend and fade through the back of the body, forecasting Hooper’s future coachwork on Rolls-Royce. The streamlined appearance was so sufficiently striking that Buick would borrow the basic style of the design for its 1942 production models. 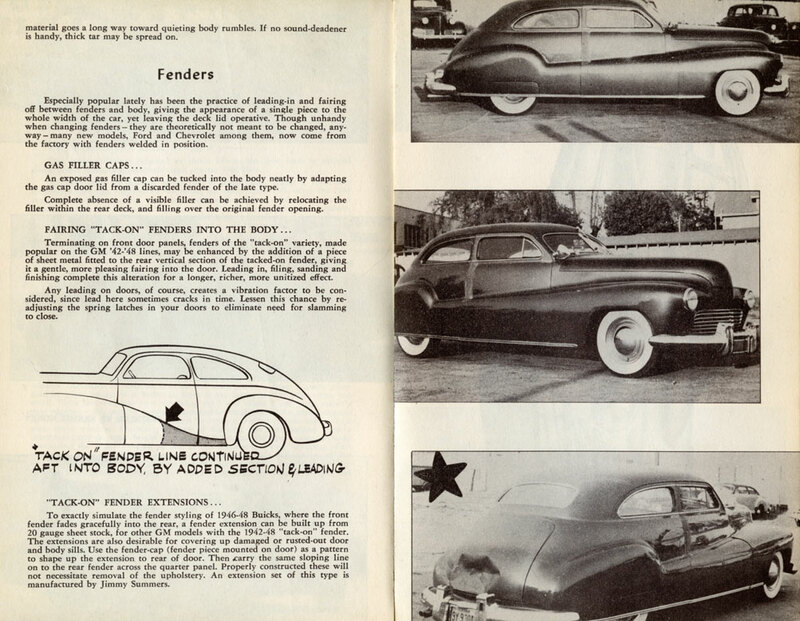 One of the first known custom Fade-Away fender jobs is the 1940 Mercury owned by Butler Rugard. The Mercury was restyled by Harry Westergard when the car was brand new in 1940, It was restyled over a period of time, but we where told that the Fade-Away fenders was one of the first restyling that was done on the car. We do not know where Harry or perhaps Butler got the idea for the Fade-Away fenders from, perhaps they had seen it on some design sketches in a magazine, or perhaps they were just thinking along the same line as these designers, and just thought about ways to make the body on the 1940 Mercury look more streamlined. The early cars, from the mid to late 1930’s that were used for the first Fade-Away fenders all have very round bulbous fenders. Fenders that perhaps do not really lend themselves to well the full fade away fender line. All of the early attempts show fading fender lines which have a very large radius, caused by the radius of the fender. Most of the early attempts also show that the width of the fade away section remains the same, and the end of the fender sits flush with the rear fender. Later we can see that the customizers started to experiment with slimmer fender extension, that were made narrower towards the rear, leaving the original rear fender line in place. The units that Jimmy Summer offered were of this type and created very elegant lines on the cars they were used. Sometimes the slimmer units were used in combination with chrome or stainless rock shields on the rear fenders. Personally I think that the later, 1941 to ’48 slightly more square fenders lend themselves to even more elegant Fade-Away fenders. The fade-away sections could be made to look a bit more crisp and slim and really made the car look a lot longer. Another type of Fade-Away fender style we will not go into to deep here is the half fade away. 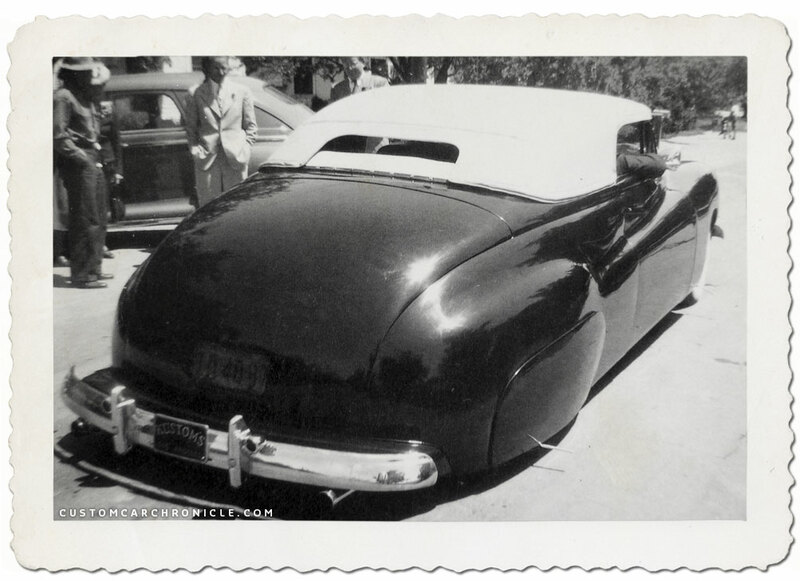 Several early Custom Cars and cars created by the Coachbuilders extended the front fenders but made the panels in such a way that the fender line would fade away in the doors. Butler Rugards 1940 Mercury is one of the first custom cars we know about with full Fade-Away fenders. Created by Harry Westergard and Les Crane most likely in 1940. More about this Mercury can be read in this CCC-Article. Another early Custom using the full Fade Away fender design was this 1938 Buick created for Richard Meade – who attended the fine arts college seen in the background of the photo. This Custom was created between late 1940 and early 1942 in the Los Angeles area. Besides having full Fade-Away fenders the car also has a raked windshield padded top, ’41 Buick taillights, ’42 Buick bumpers, custom hubcaps and teardrop skirts. Richard remembers the car being built by both Jimmy Summers and Coachcraft. 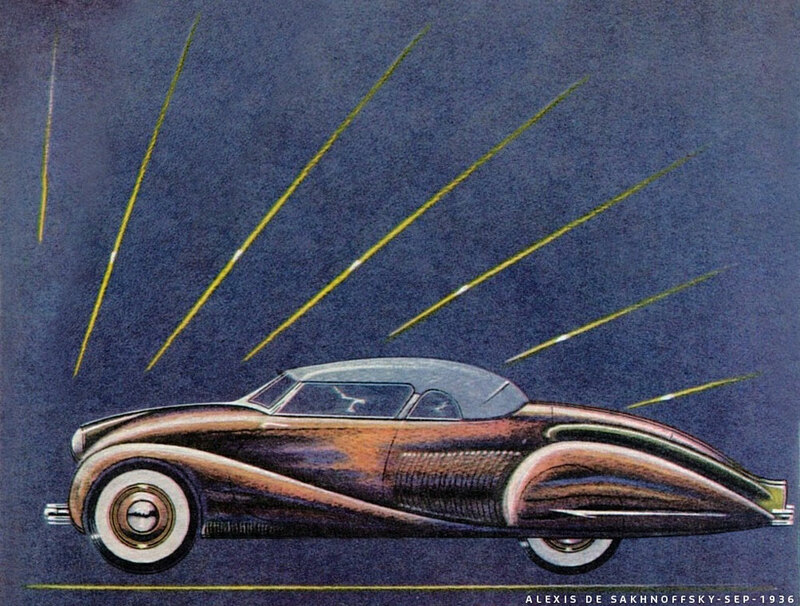 The car appears in the earliest edition (1944) of the Custom and Restyle book by Dan Post. Jimmy Summers and Fade-Away fenders have always belonged together. Jimmy was possibly the only Custom builder that ever offered an aftermarket kit for Fade-Away fenders. At least in our research we have not been able to found any other source for these. Jimmy’s product was called Fender Extensions and were specifically made to fit the 1942 to 1948 Chevy bodies. Two types were offered, one for the Aero Sedan and on for the convertible, coupe and sedan body styles. But more than likely these panels ended up on several other brand cars as well. The Popular Mechanics article called They Tailor their own cars from May 1947 showed two very interesting photos of Jimmy Summers working on one of these Fender Extension kits. 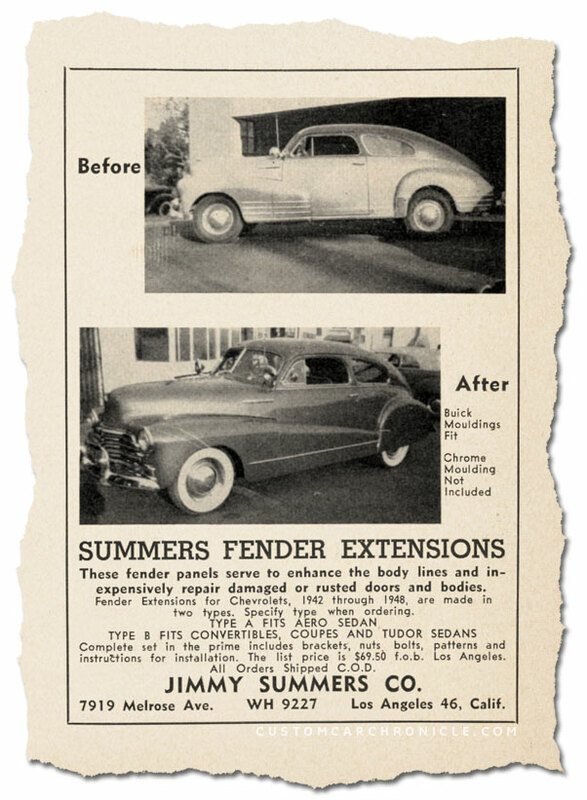 Jimmy Summers Fender Extensions ad in a 1949 Hot Rod Magazine. 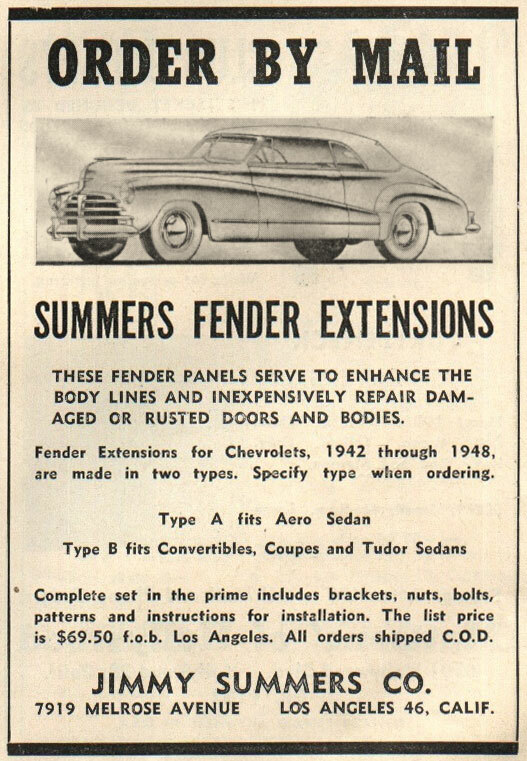 Jimmy Summers ran this ad for the Fender Extension in the Hot Rod Exposition program book from 1949. 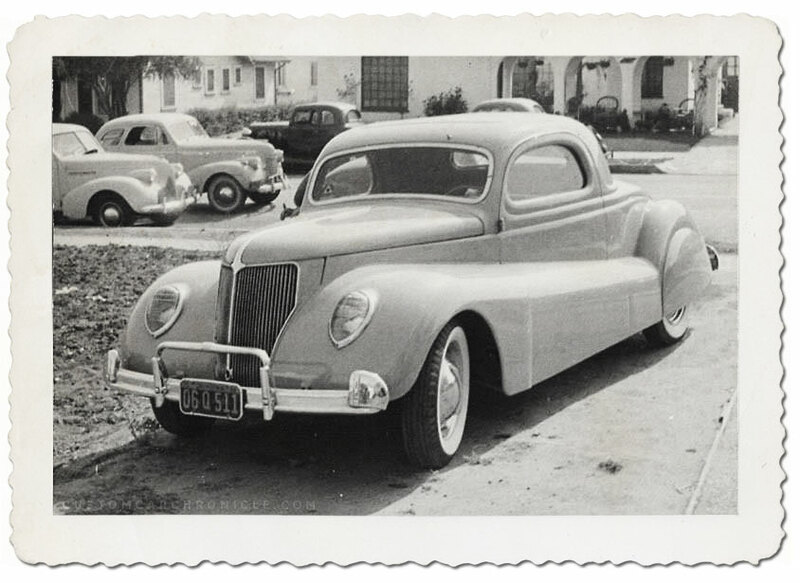 Another very early Custom that had a set of full Fade-Away fenders was a 1936 Ford Coupe owned by Bob Fairman. Bob worked with Jimmy Summers and most likely the two worked together on this car. The top was chopped, the body dropped over the frame and the front and rear fenders raised. The front fenders where reshaped completely to accept 1937 Ford headlights and flow into hand made Fade-Away panel. The Fade-Away panels on this car are separate units that bold on to the main body, just like the kit Jimmy Summers would later sell. We do not have a date when this car was built, but the photo below appears to have 1942 license plates, and the newest parts used are the 1941 Ford bumpers. The Ford is still around today, although in very bad shape, it has been rusted in a yard since 1972. 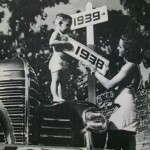 Bob’s 1936 Ford has been published quite a bit in the early publications, and most likely played on important role in the popularity of the style. Photo taken in the early 1940’s show the rather bulbous full Fade-Away fenders on Bob Fairman’s 1936 Ford. 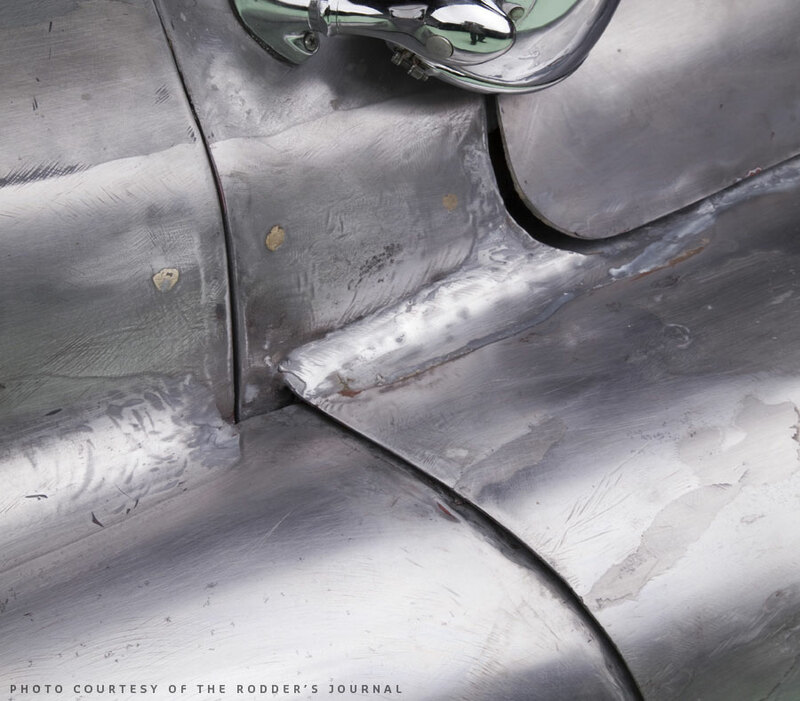 The new fender lines looks a lot like the fenders used on the Jaguar XK120, but those did not come out until 1948. 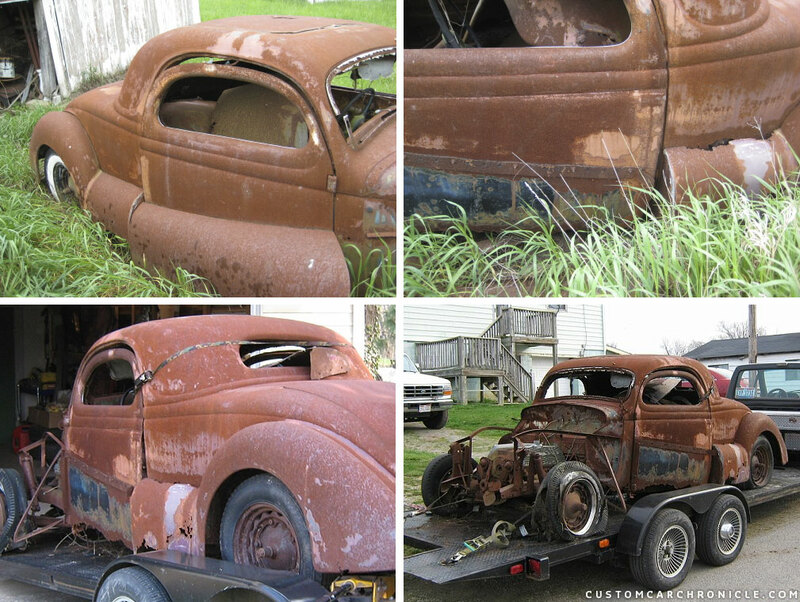 These photos are from Bob’s 1936 Ford taken in 2009 and 2010. The car had been sitting in a field for almost 30 years. It is even amazing that is has survived this long. The last info we have on it is that the present owner is doing all he can to save it. The Front fenders, not shown in the photo are supposedly stored inside the car. Although its heart braking to see these photos of the car in such a state, it also gives us a great look at how the fender extensions were used. The 1942 and postwar Buick Roadmaster was longer, lower, wider, and roomier than before, thanks in part to a three-inch-longer wheelbase. The Buicks for 1942 sported a complete restyling, which was highly unusual at a time, when most of Buick’s competitors offered only modest face-lifts of their 1941 designs for 1942. New restyling included a new vertical-bar grille that would be carried over in modified form through 1954 and, on some two-door models, including both Roadmasters, and the “Airfoil”, front fenders that swept back all the way to the rear fenders. The 1942 Buick Roadmaster was the first production car to feature production Fade-Away fenders. Most other cars from that time could still be considered fat fendered with separate bulbous front and rear fenders. while the new Buick lines included a continuous sloping line of the fade-away from the front to the back of the car added a graceful, flowing appearance. 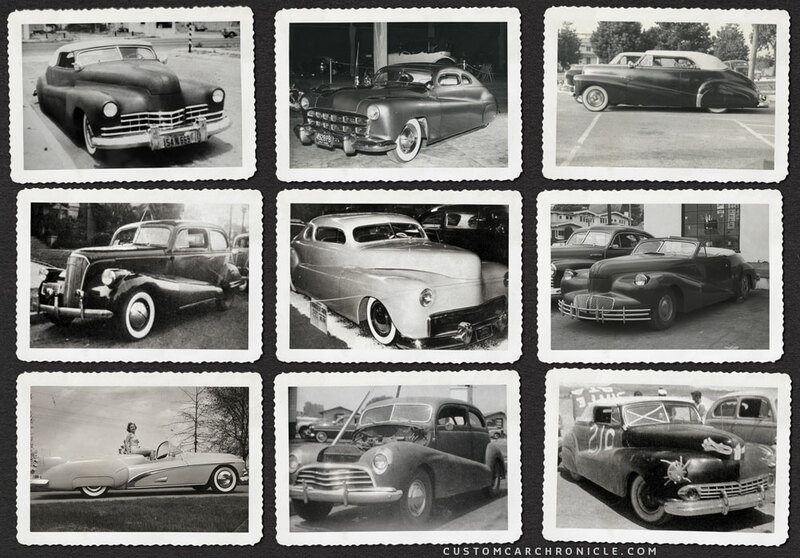 Seeing these new 1942 Buick’s on the roads must have inspired many Custom Car builders during and shortly after WWII. 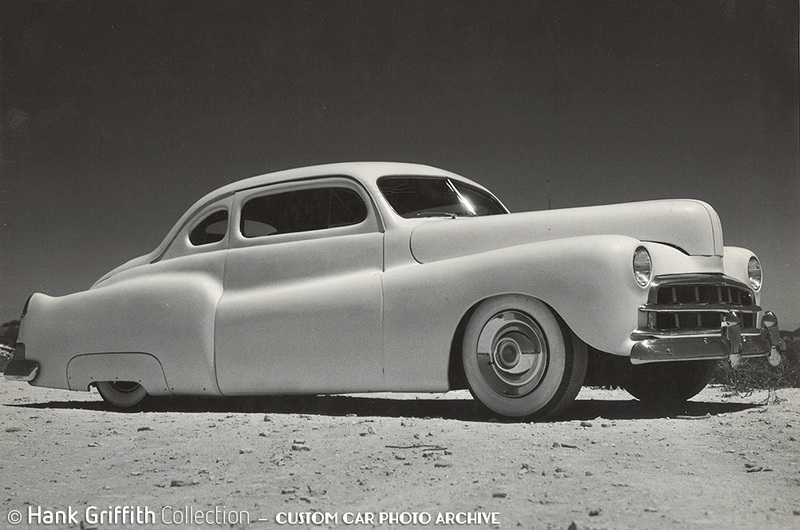 Bob Creasman chopped the top and channeled the body over the frame 4 inches of his 1940 Ford Coupe. In 1948 Creasman fitted his coupe with the full Fade-Away fenders. Notice that the sides of the Fade-Away panels sits flush with the rear fenders, making the fender sections look rather wide, especially when compared with the 1942 Buick pictured above. 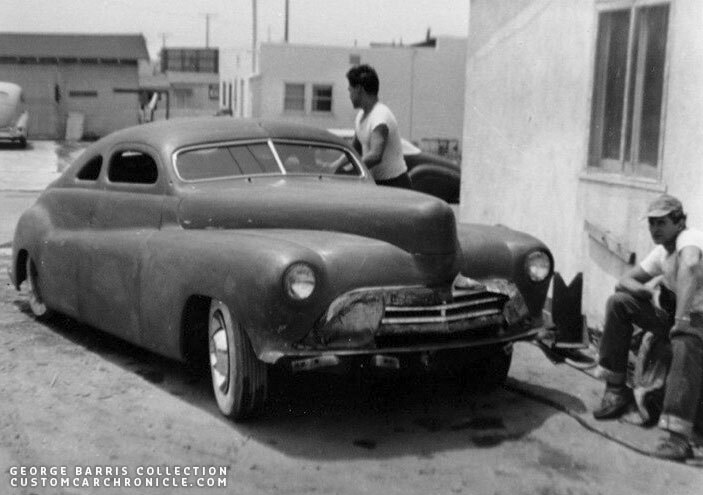 Even though several more shops where known for doing great work on full Fade-Away fenders on Custom Cars, it was Gil Ayala’s shop that was recognized by it for the style, back then, and even today. While the fade away fender extensions created by Jimmy Summers where mostly bolt on units, it was the Ayala’s that were known for the wonderfully smooth fully molded-in version of the fade-away fenders. We do not know when the Ayala’s created the first Fade-Away fenders on their Custom Cars, we do know that Gil added them on his own personal 1940 Mercury in 1949. The shop did at least two more cars with full Fade-Away fenders, but more than likely there were more than that. Hank Griffith’s 1942 Ford had a set of full Fade-Away fenders created by the Ayala shop. 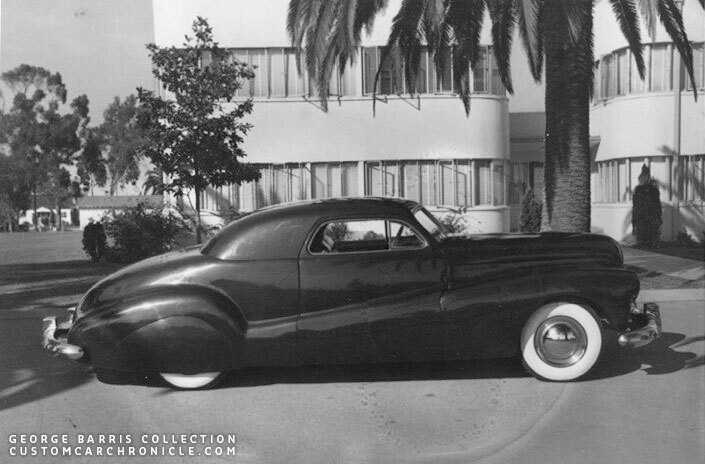 The Ayala’s used a set of 1950 Cadillac rear fenders and two front doors to create the Fade-Away fenders on this car. The new fenders made the car look much more modern, and streamlined. More about this car can be seen in the CCC-Article. The Barris shop has created quite a few custom cars with full Fade-Away fenders. 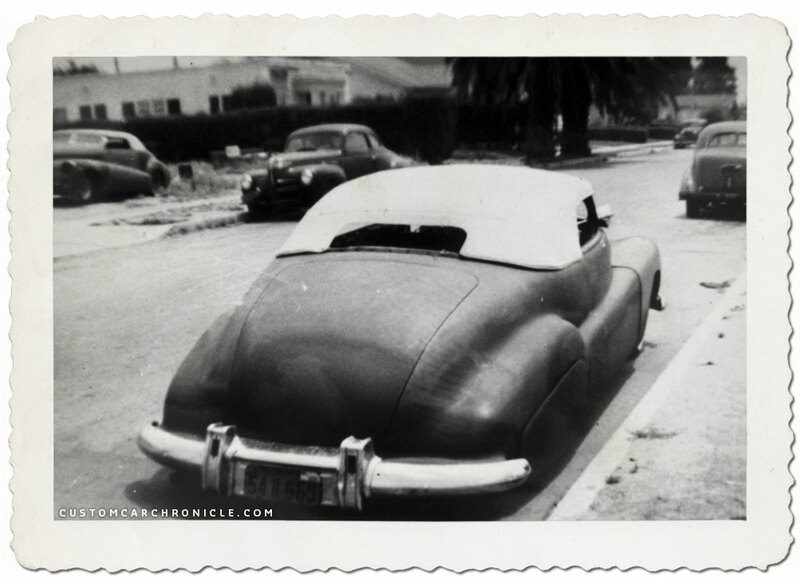 It all started with George Barris his own 1941 Buick Convertible which he bought after his 1936 Ford Over a period of time George restyled the Buick in one of the most amazing looking custom cars of the time. We have not been able to put an excact time on when the car was built, but most likely the fade away fenders were done around 1946-47. The car was completely finished in 1948. We also do not know if George used perhaps the fade away panels of the Buick, which could have been bought from the dealer, or perhaps at the junk yard, or if he hand fabricated the Fade Away panels by himself, or perhaps with the help of the Calfornia Metal Shaping shop. We do know that the car was a huge success, and Georg has mentioned he did several with similar fenders for a few customers. 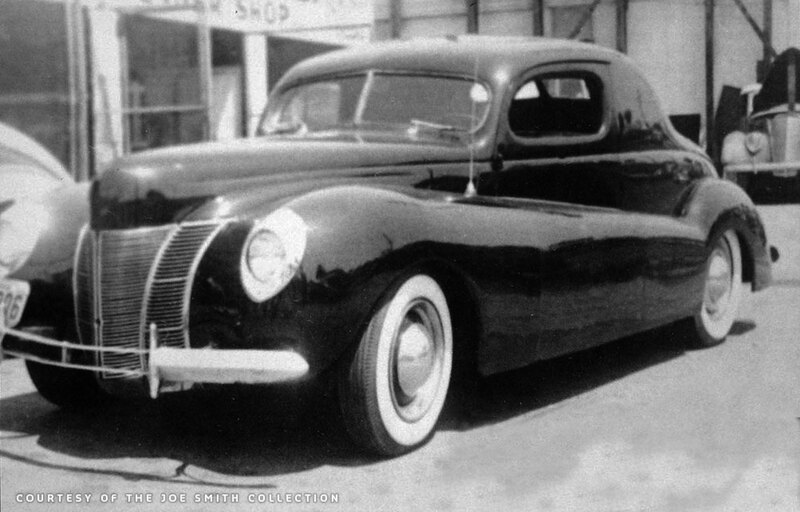 Early version of George Barris his 1941 Buick with black wall tires, and cut down 1942 Cadillac grille. This is an very interesting photo of George his 1941 Buick in primer, after he had an accident with the car and after the repaint and some more restyling had been performed. This photo is interesting for many reasons, but especially because a similar styled full Fade-Away Custom can be spotted behind the Barris Compton Ave. shop on the far left side of the photo. This photo was taken in either 1948 or ’49. 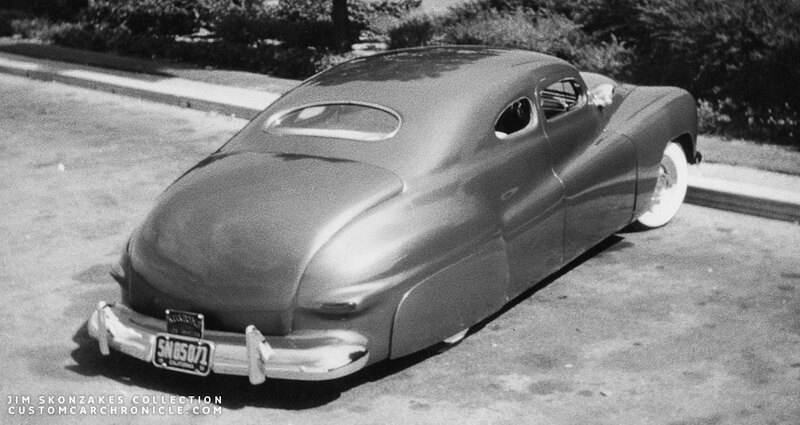 Another early Barris creation with full Fade-Away fenders was this 1941 Buick coupe done for Var Martin. This side view photo gives us a good look at the shape of the fade aways, which are slightly narrower at the back. The shape of the front fender basically dictated how much dip there would be at the end. Gorgeous lines on this one, who knows what happened to it? Bill deCarr build his own personal 1941 Mercury with a set of Full Fade-Away fenders creating one of the most beautiful full Fade-Away customs ever. Bill can be seen her with his freshly primered Mercury at the back of the Compton Ave Barris Shop. Notice how the fade away fender lines looks much slimmer than on the 1930’s models, and how high the rear of the fender extension sits on the body. Almost creating car model lines from cars that would come out the next year. The Johnny Zaro 1941 Ford had its front fenders raised before the fender extension was created. This rear 3/4 view is perhaps the most attractive for this car. Harry Westergard created this stunning 1941 Cadillac with full Fade-Away fenderline and 1948 Cadillac rear fenders. The flowing fade away fenders are nice and crisp even though they have been molded to the rest of the body. There is a clear line between the fade-away sections and the rear fender, which create very interesting lines on the car. One of the very best Fade-Away fendered Customs ever done. 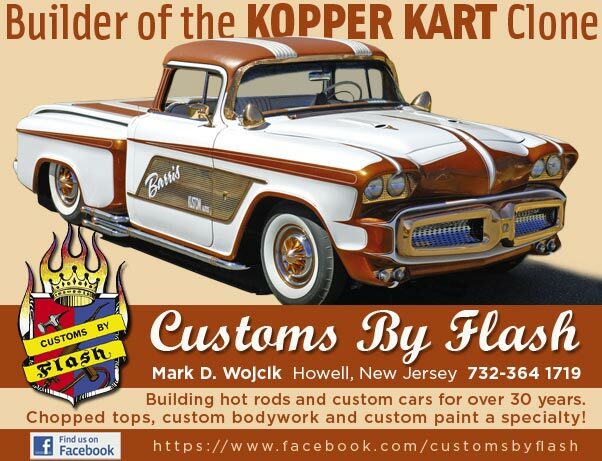 The car is now owned by Custom Car Collector Kurt McCormic. Some more samples of Custom Cars with full Fade-Away fenders.Interesting to see is that not only coupes and convertibles recieved the full Fade-Away fender treatment. One of the reasons why we do not see a whole lot of Custom cars with Fade-Away fenders, from back in the early days, or currently built, is because they are quite complicated to create. The cars to which the fade away fenders are being added, have door hinges never designed to be used with fade-away sections. Creating the fade away section in itself is perhaps not really all that complicated for a body man, but making the door open and close with the new panels added is a different story. The section of the fade away fender located at the front of the door will need to move inboard on the fender section when the door is opened. Therefor this section needs to sit slightly lower than the fender section, or at least the edge needs to fit inside. We have chosen two samples cars to show this section up close. 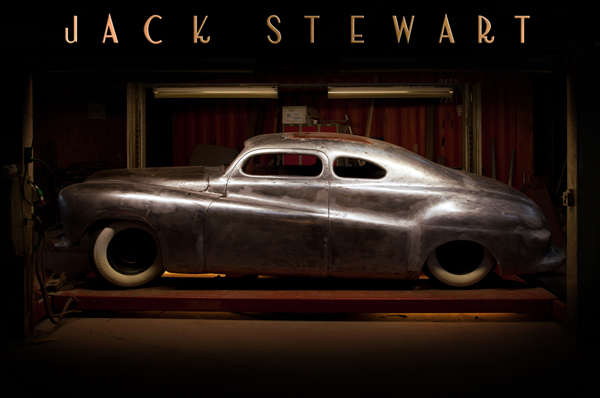 The first one, in bare metal is the Jack Stewart 1941 Ford created by the Ayala’s. While the photo are being made of the unfinished car it gives us a good look of what is needed to make this all work. 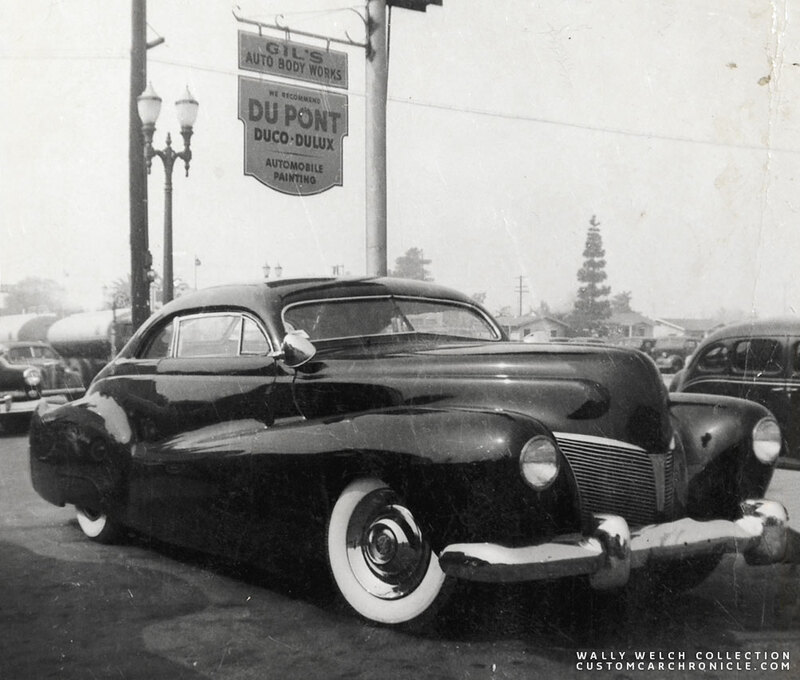 The second one, the Harry Westergard’s created 1941 Cadillac uses a slightly different, perhaps more elegant way to make the doors open and close. For both and others we have to keep in mind that these are close up photos and the flow of the Fade-Away fenders will look much more natural from a normal distance. The fender extensions on the Jack Stewart Ford are created by the California Metal Shaping company and custom fitted by the Ayala shop. Looking up close we can see quite a gap at the line where the front fender ends, and the door extension starts, especially where both meet the rest of the body. Also noticeable is the way the door extension section is folded in a bit to make sure it will fit inside the fender section when the door opens. Keep in mind that a lot of fine tuning still needs to be done on this body. The door line on the Westergard Cadillac is flowing differently than on the Jack Stewart Ford. The lines look much more factory here. Perhaps the fade away panels from a Buick were used, or perhaps the Jimmy Summers units were custom ordered. The restoration of this car did not reveal any of the secrets on how the panels were created. Wonderful article once again Rik. I suspect your mystery vehicle from the Dan Post books might be based on a Cord Sportsman . I always thought the the full fade away fenders were a natural for the 46-48 Chevrolets as they already had a partial one. To me they just don’t look right on the earlier(Late 30″s) running board cars. But from about 1941 on they were perfect. This is just getting better and better. Amazing article on a great topic. Great article on a beautiful custom car design related topic , where in the world media would this extensive “in depth” analasys of custom car design be found . There is a natural continuing of fadeaways made in the cars made from 1949 and forward as well , Sam Barris Buick had if ofcause from the factory but several of the 49-51 Mercs had fadeaway styling made as well , Sam Barris -49 Merc , Hirohata Merc , Louie Bettancourt Merc , to summarize the love of fadeaways , a streamline design feature making the custom car much more luxurious and beautiful . Big thanks Rik , your making another dreary day golden ! I am speechless. I´ll just copy Wolfs comments. thanks Rik….another amazing story from you. Wonderfully researched article again, Rik. Keep ’em coming! Been waiting for this one Rik… This design element is very dramatic and a definite indicator of the times that inspired it. It seems to work best on the longer wheelbase cars…The Creasman ’40 not so much, Stewart Ford works very well, as does Ayala “40 mercury.Barris Buick and Westergard Cadillac are the elemental applications. Great article Rik, thanks for sharing! 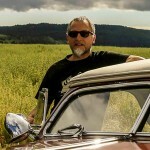 Hey Palle, Your car is awesome……….. And so is that photo………..And YES it shows the Fade-A-Way just perfect….!! Now I can see why your having trouble putting paint on the car…….!!! It looks just as awesome bare….!! !